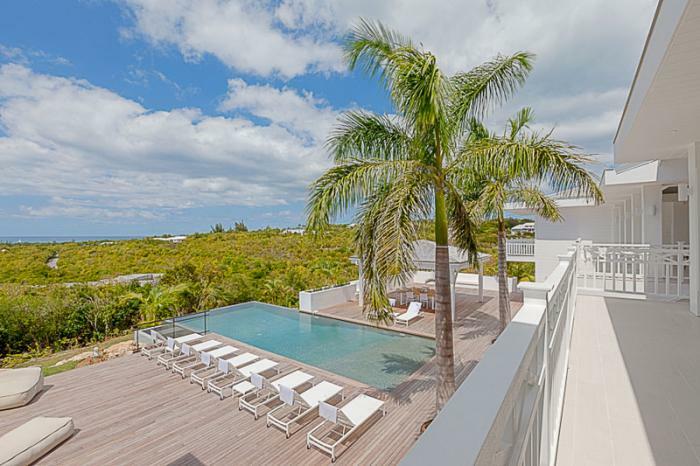 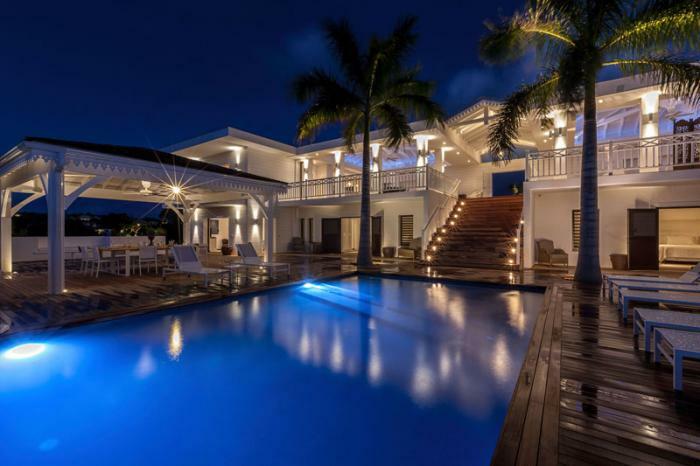 Built on 2 levels accommodating 6 bedroom suites, the residence has a vast living/dining area and gourmet kitchen and a large pool and deck with poolside gazebo. 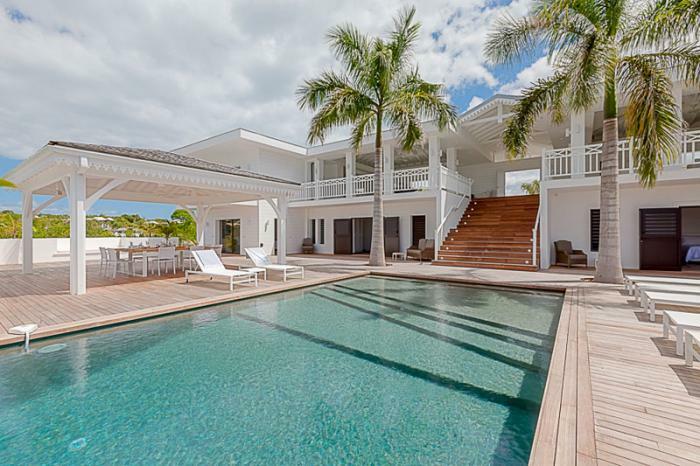 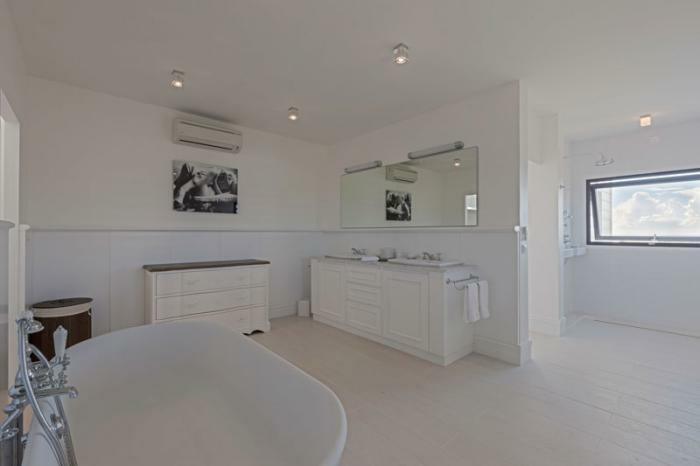 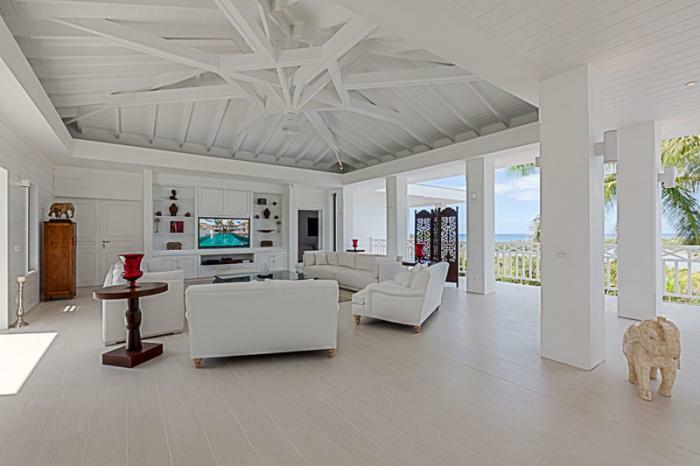 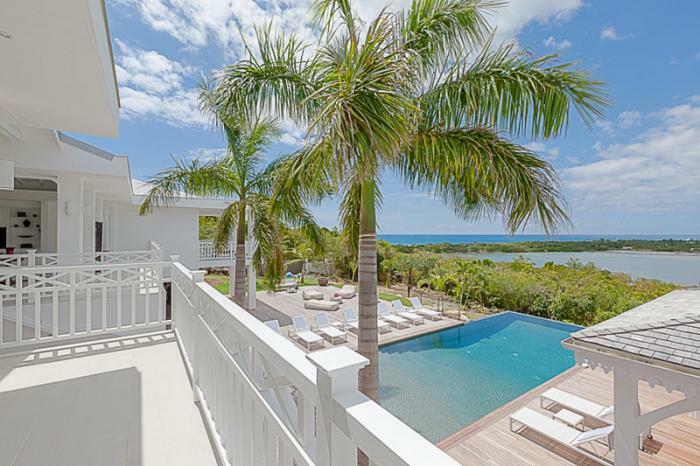 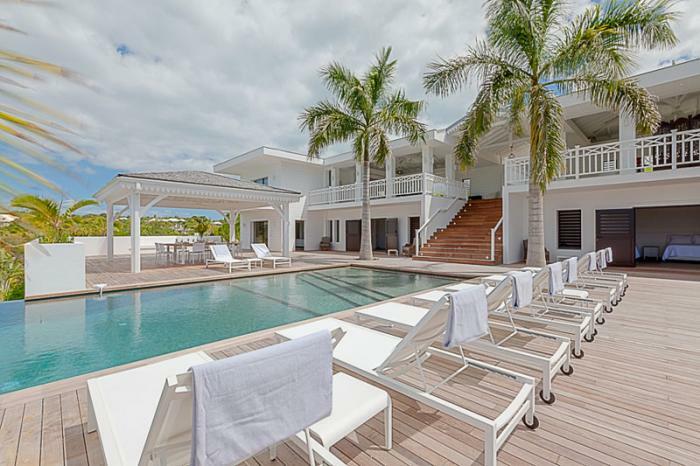 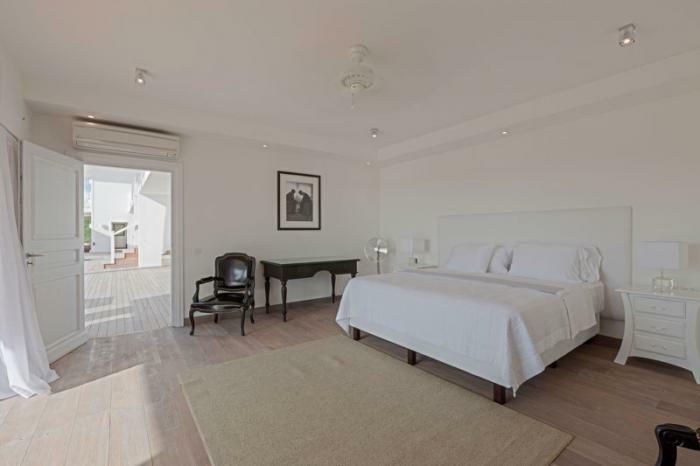 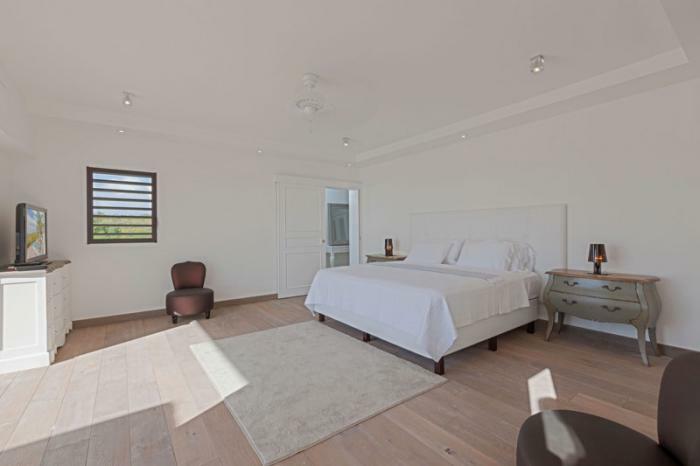 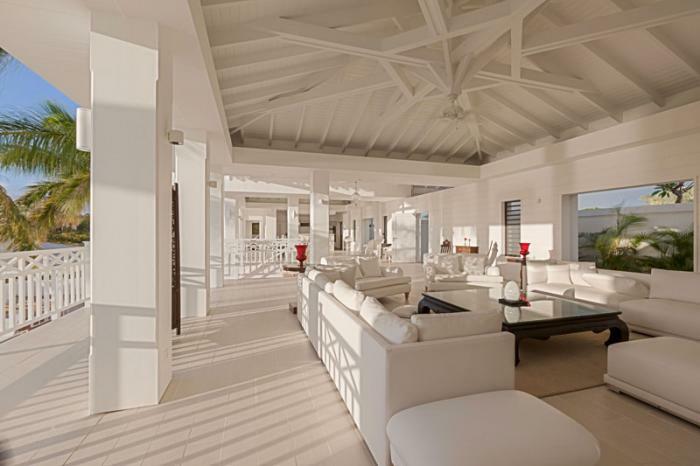 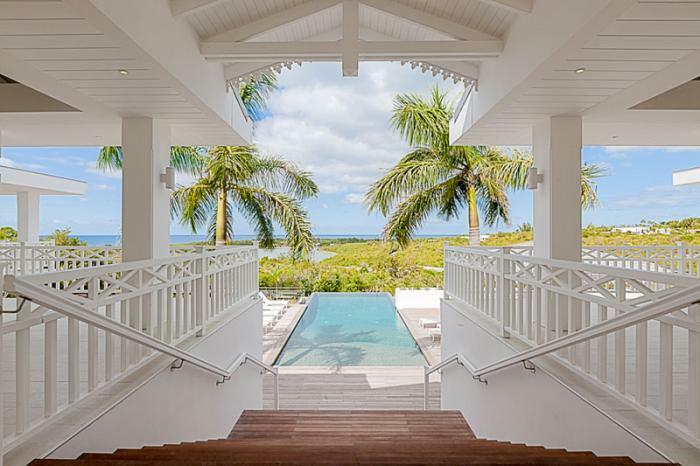 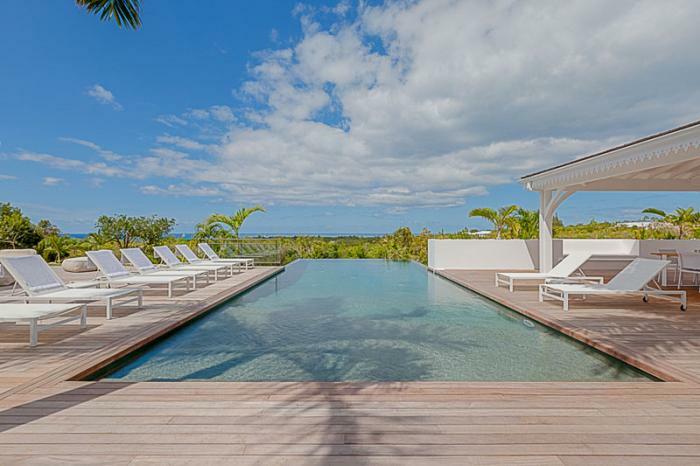 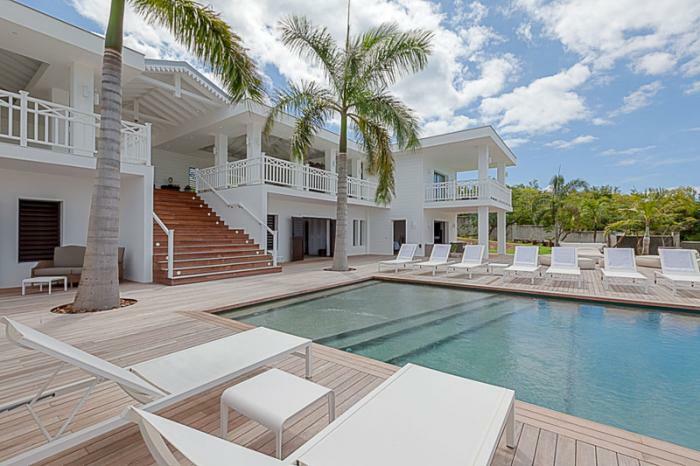 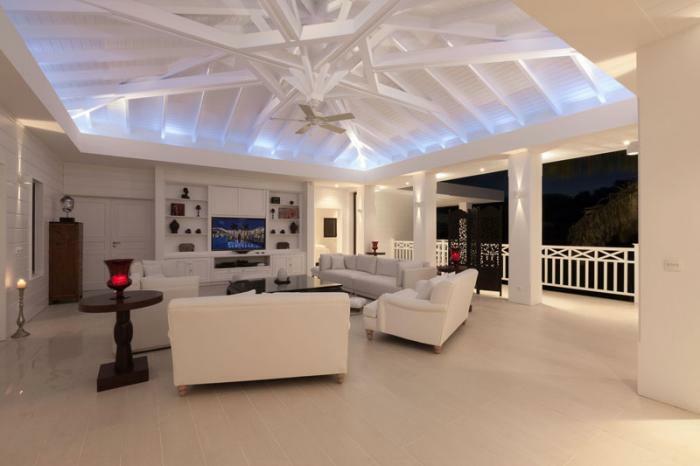 The main level accessed over a small bridge and water feature, houses the stunning white interior spaces of the living/dining area furnished with designs by Manutti , Blanc D’Ivoire and Philippe Starck and white oak flooring throughout. 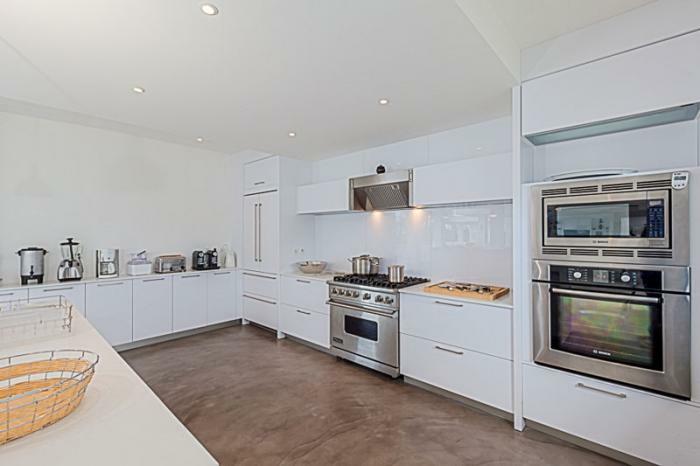 The European designed Haker kitchen has Viking appliances, white quartzite work tops and polished concrete flooring. 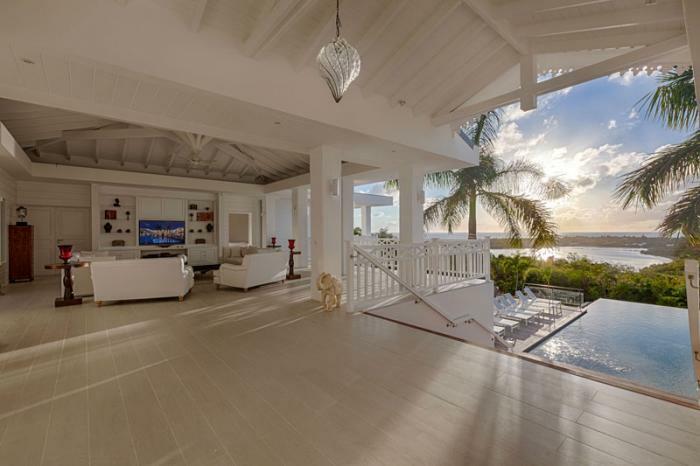 The whole length of the living and dining area is completely open on one side to the fabulous ocean sunset view and view over the pool area. 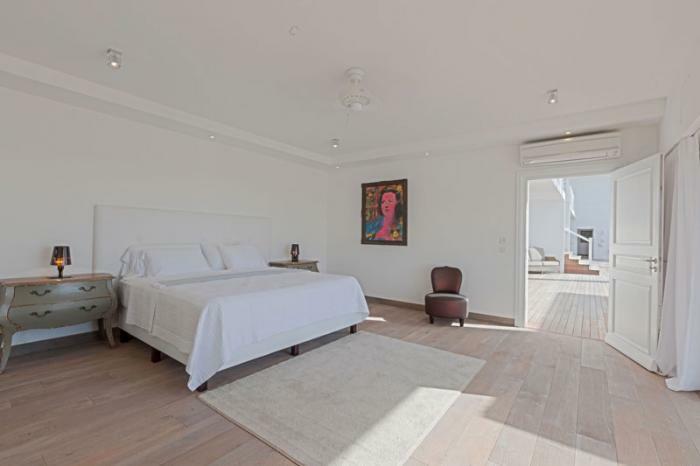 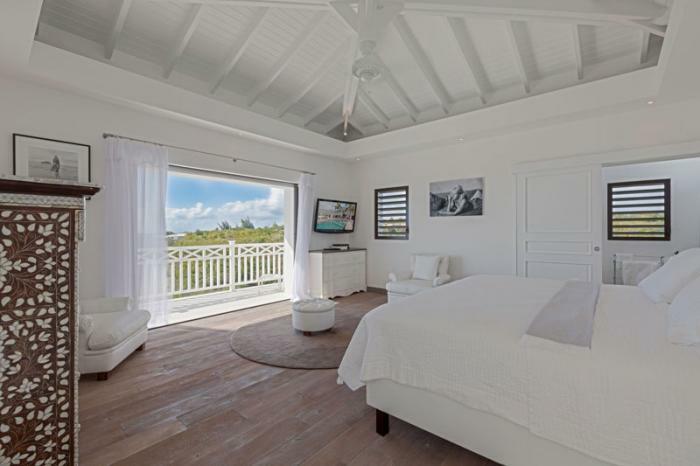 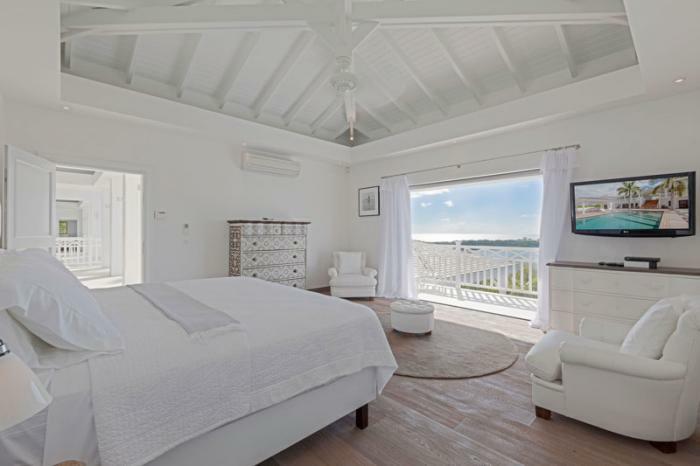 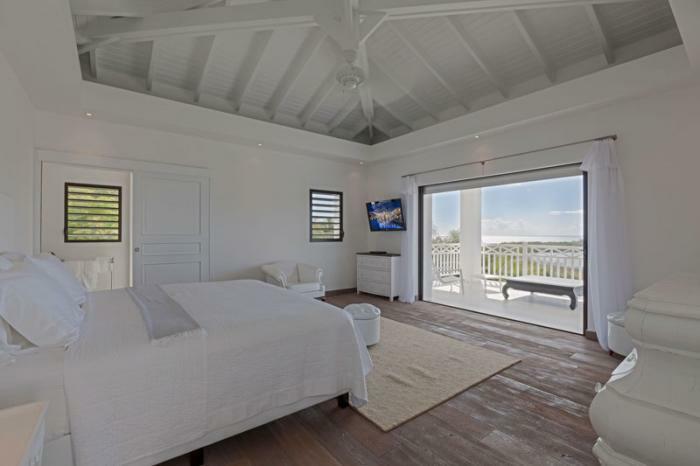 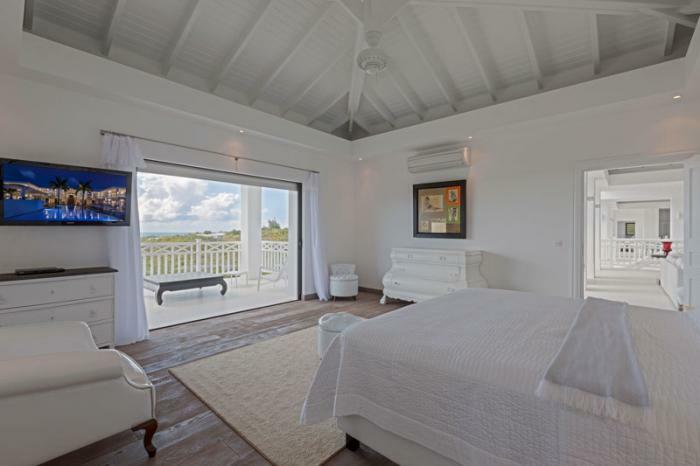 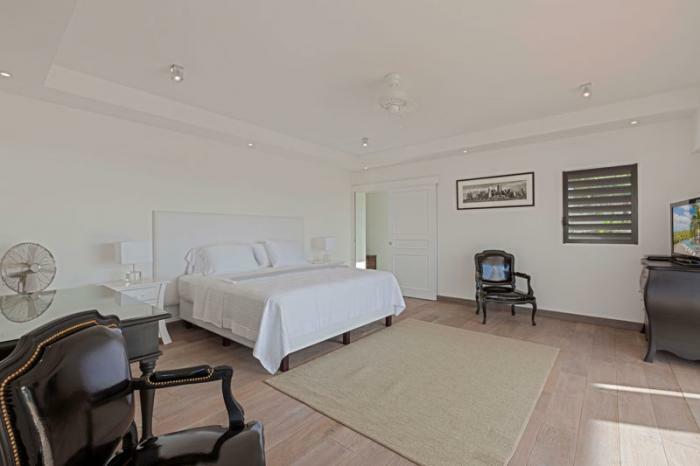 Flanking the living area on either end are two palatial bedroom suites each with king–size custom made beds and Blanc D’Ivoire furnishings. 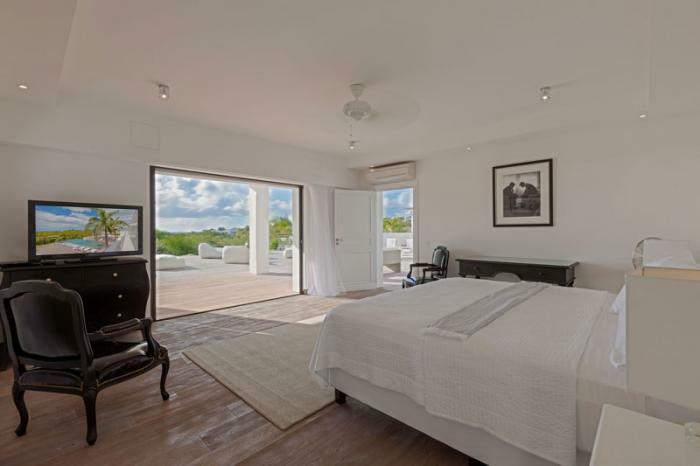 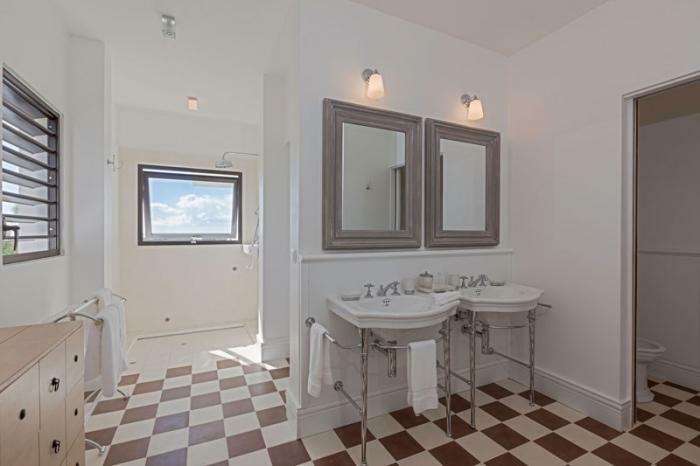 Both suites have private balconies overlooking the pool terrace and “Victoriana” style en-suite bathrooms with Devon & Devon fittings. 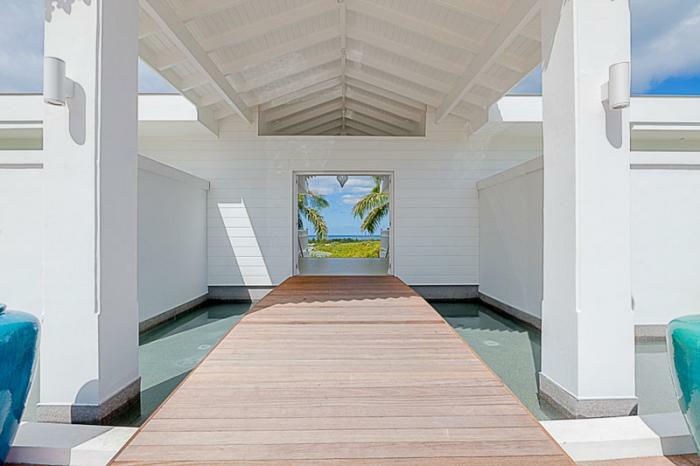 A grand staircase descends from the main level to an extensive deck with a large infinity pool and shaded gazebo, with outside dining and lounge area furnishing by Paola Lenti and Tribu. 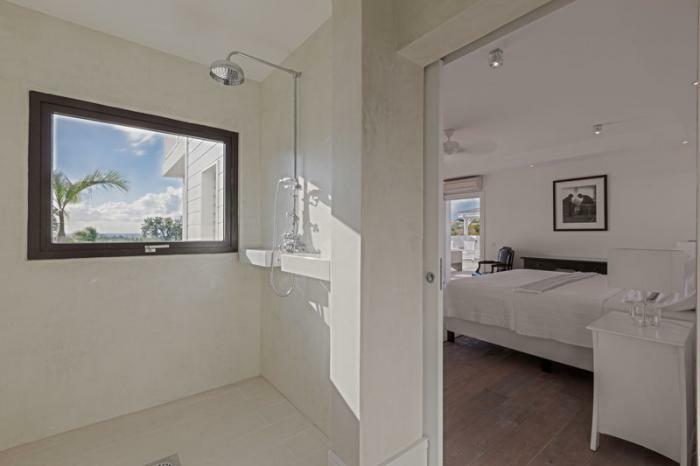 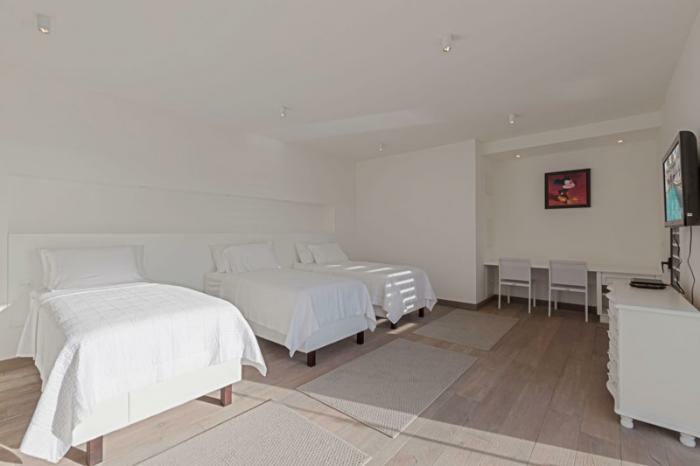 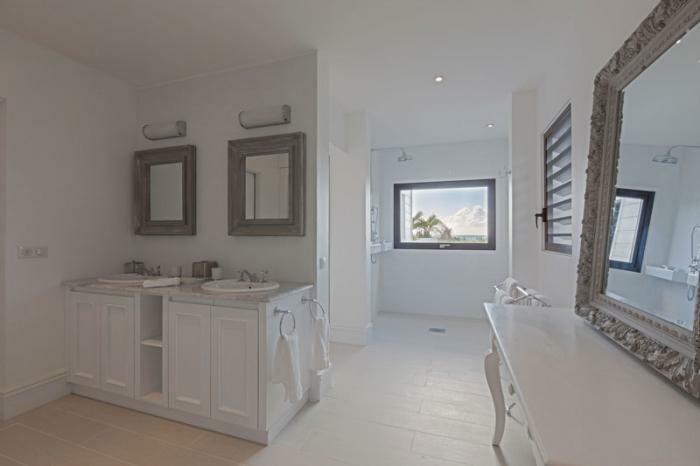 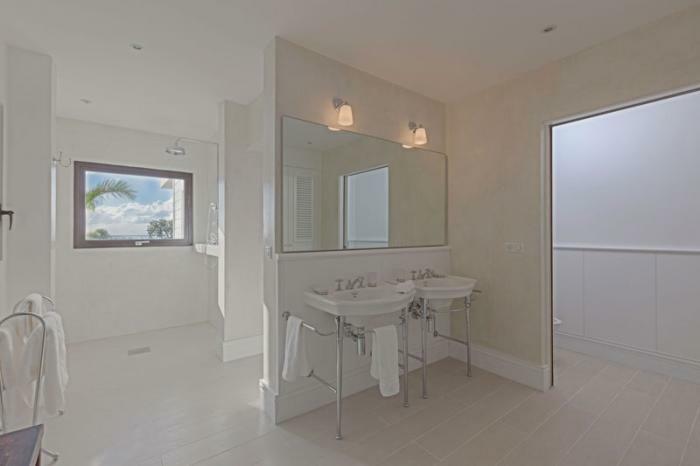 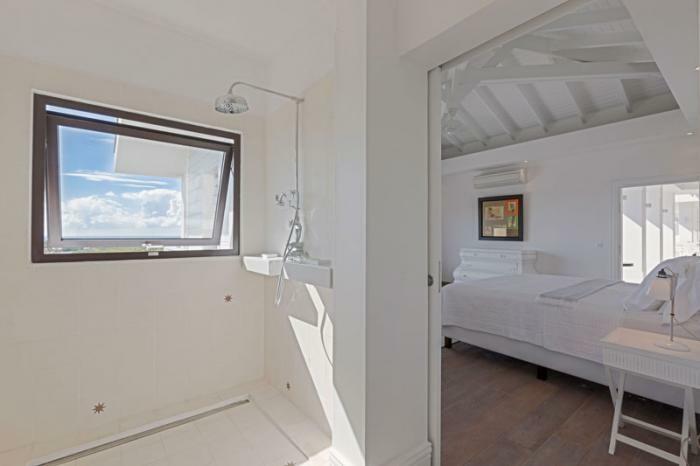 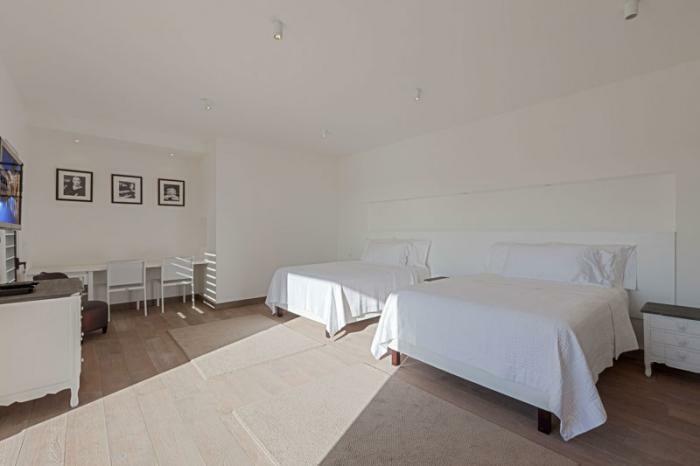 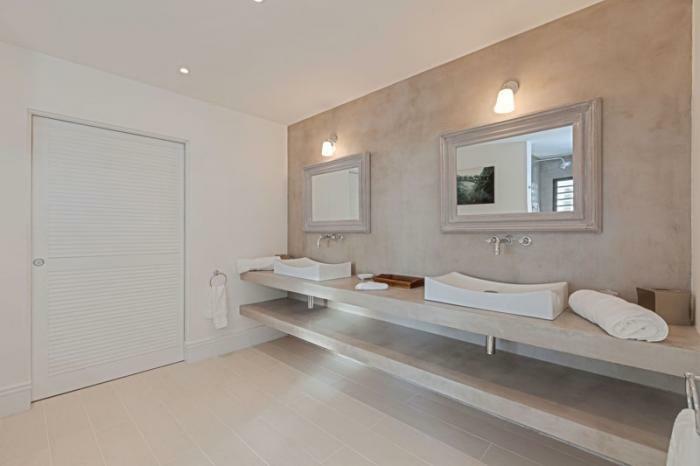 The four remaining bedroom suites open off the pool terrace, each with en-suite designer bathrooms in polished concrete. 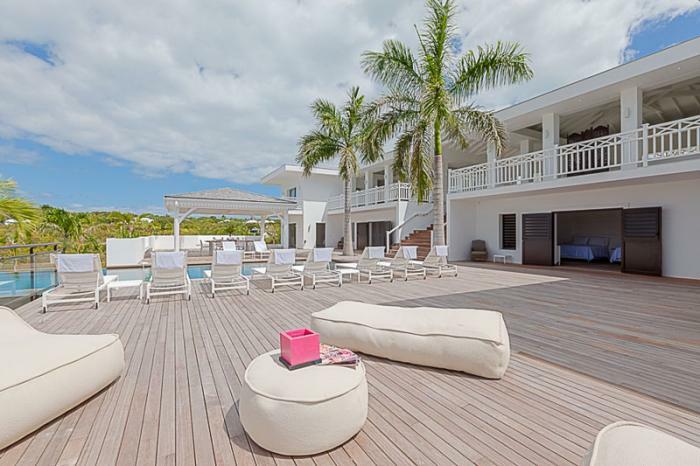 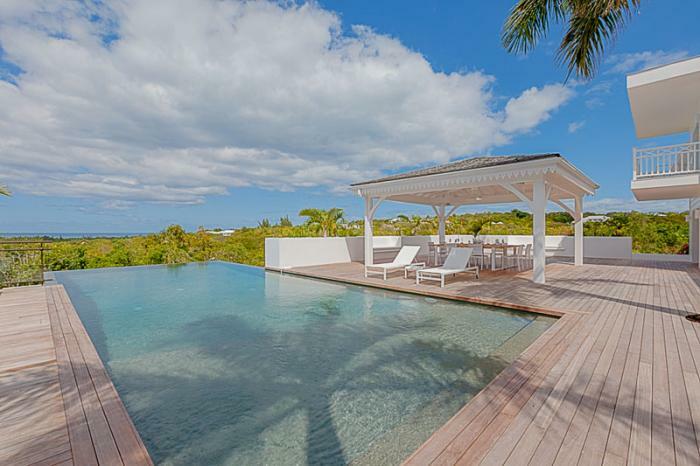 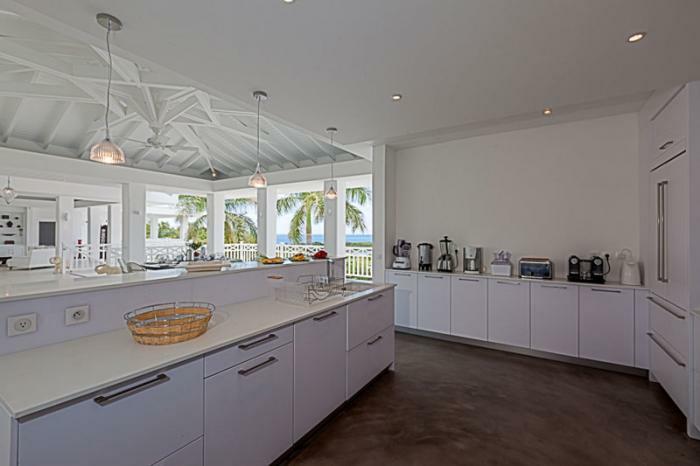 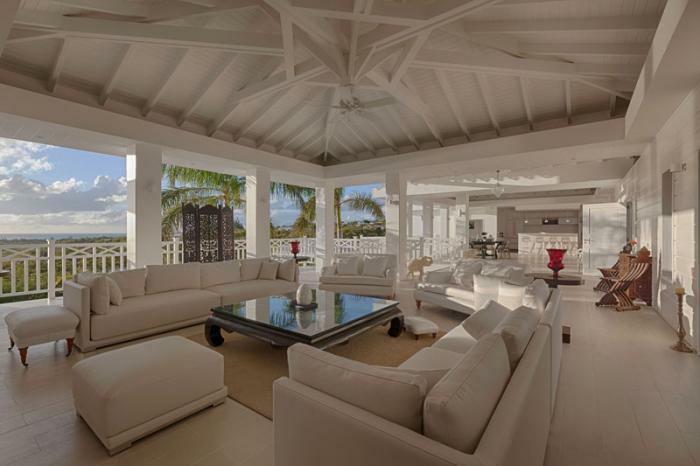 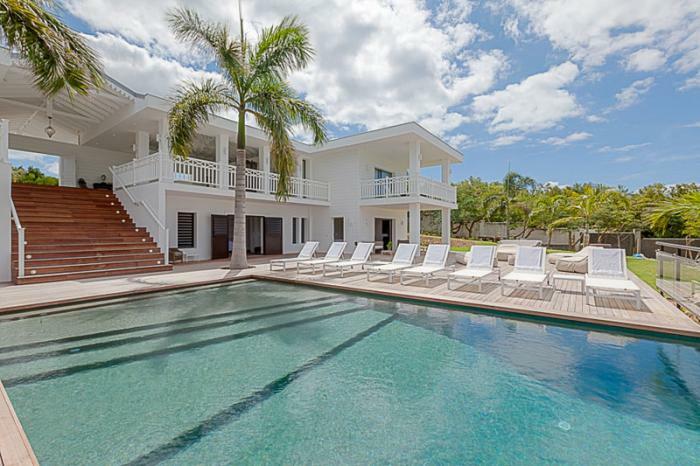 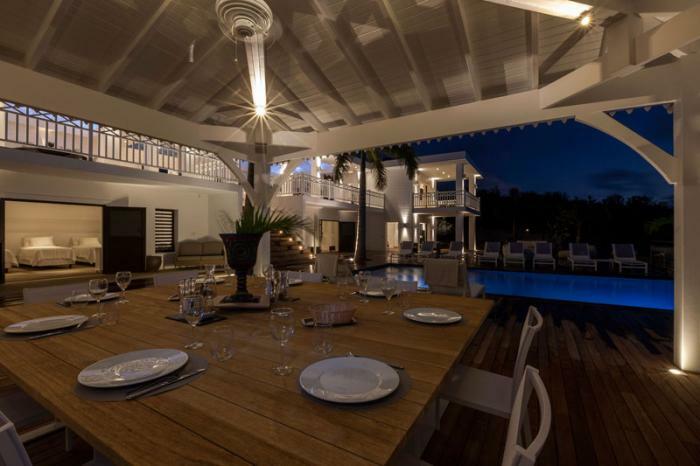 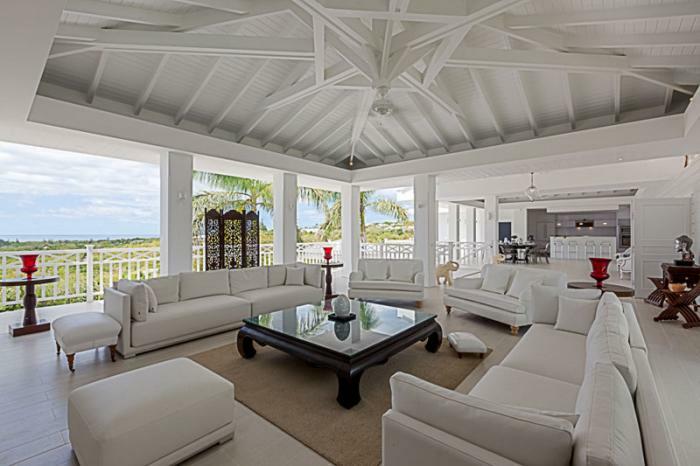 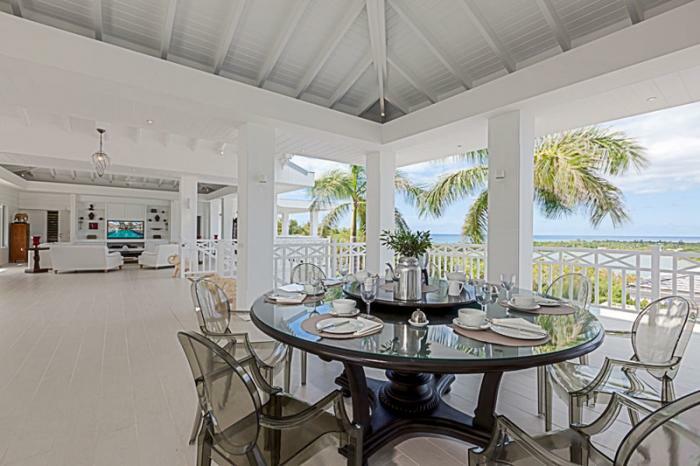 Always is a fabulous Caribbean retreat perfect for large families or groups. 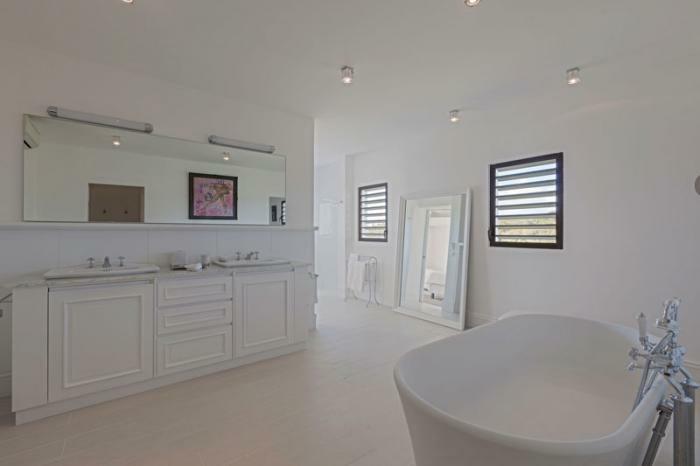 Within minutes of the beautiful Terres Basses beaches.